We are asked about this situation frequently. When deciding how to enter your children, be certain you make it easy to find each of your students. They should be entered with their own last name, even if this requires creating more than one family account. While doing so, enter your last names properly making it easy to contact you as well. Tips: If siblings are repeated in multiple family accounts, they will appear as duplicate entries in the system and on class lists. To avoid this, when siblings have different last names or households, reference their names in the Family Display Note rather than entering them as students twice. Create one family account for each given (last) student name living in your home. Add family information in full as it pertains to all students in that family. Siblings with different last names (or household arrangements) can be referenced in the family display note. Enter full household information for each family with the exception of siblings. Only enter students for those children matching the last name and household information for this account. Siblings not matching this data can be referenced in the Family Display Note. This will avoid duplicate system and class list entries and illustrate the correct household contact information for all students entered in this account. Betty Jones-Adams and Mike Adams have four children living in their home. Bridget Adams (his) and Matthew Jones, Jack Jones (hers) are from their previous marriages. Together they have a son, Tyler Adams. Bridget's mother, Karen, provides her 2nd household. She has remarried and has a new last name - Johnson. Matthew and Jack's dad, David, provides their 2nd household. 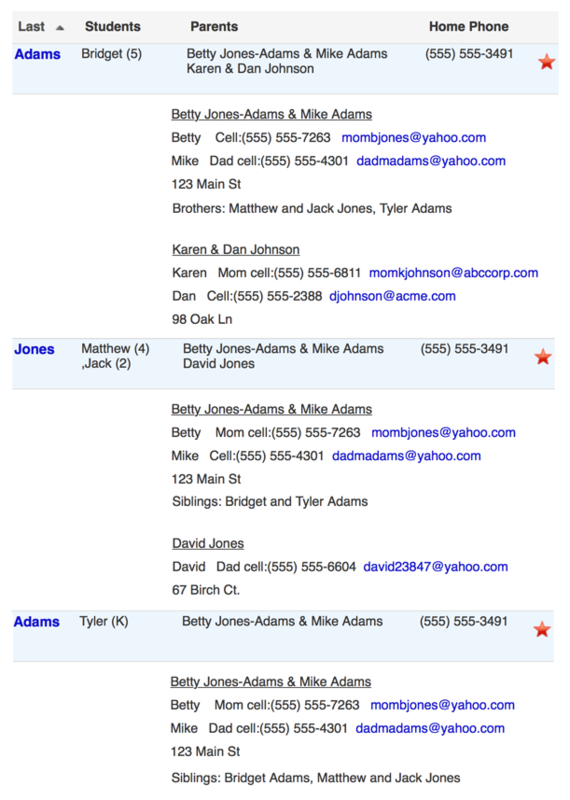 Note: When looking up this family by last name "Jones" or "Adams", all three entries will appear. This is because both parent and student last names are considered when looking up by family. Option 2: List all children as students in each account. Enter full household information for each family, enter all children as students. By entering all children in your home as students in each last-name account, your children will appear as duplicates in the system and on class lists. As well, there could be confusion about parent contacts if this varies from child to child. This is not the suggested method but may be preferred by you.